Vernon Mcgee said �You can tell a Christian by his use or abuse of money.� The Bible says we are to love the giver but not have the same love for what he gives. Unfortunately people want the blessings today by a formulae or the blesser to lay hands on them or say a word that will comfort their troubled heart. All along God is saying to seek him not man, but it is only said to a deaf ear because they have a heart to follow anointed ones instead of the anointed one. God meets our needs not our greed's. Simple but elusive for those caught in the web of deceit of giving to get a blessing. The Lord is not in need of our money God created the universe. He sustains it by the word of His power. He doesn't need your money, and He doesn't want your money, he wants our time our abilities our life to be put in his hands to be used, this may include our money but what God wants is "you", and He wants you with a right attitude. The silver is mine and the gold is mine,' declares the Lord Almighty .' (Haggai 2:8). Question "Who has ever given to God, that God should repay him?" (Romans 11:35). Answer- This is a rhetorical question with no answer, because the answer is obvious, or should be. You cannot give to God with any expectation that God will be obliged to respond to you by either more money given or other blessings. John 4:35-38: "Do you not say, 'There are still four months and then comes the harvest'? Behold, I say to you, lift up your eyes and look at the fields, for they are already white for harvest! "And he who reaps receives wages, and gathers fruit for eternal life, that both he who sows and he who reaps may rejoice together. "For in this the saying is true: 'One sows and another reaps.' "I sent you to reap that for which you have not labored; others have labored, and you have entered into their labors." Clearly Jesus is addressing reaping rewards for eternity having nothing to do with money. This is not fields of money but souls that we have personally engaged in accepting the Gospel. It is about having your riches in heaven not earth. Gal 6:6-9: "Let him who is taught the word share in all good things with him who teaches Do not be deceived, God is not mocked; for whatever a man sows, that he will also reap. For he who sows to his flesh will of the flesh reap corruption, but he who sows to the Spirit will of the Spirit reap everlasting life. And let us not grow weary while doing good, for in due season we shall reap if we do not lose heart." If you sow to the flesh= means your desires, selfishness. If you will live focused on the world you will be without any spiritual life, therefore no reward in heaven. When this relates to money it means spending it on ones own pleasures and comforts . Yet in the opposite, it means giving so that one is obligated to give back, that someone who just so happens to be God. If you sow to the Spirit= If you crucify your own desires, means you live a life pleasing to God you will have eternal rewards. Your payment is in heaven not here on earth. When this relates to money it means to use it for the furtherance of his interests not so that hell bail you out in debt, by giving him money. Praise the Lord that he does do this by his grace but this should not be our motive to give. If we are giving to get out of debt or to get more money then it is presenting God as one who caters to our selfish motives without ever teaching us the lessons we need to learn. We become spoiled children who can pay our way out of any mess. This is not the Biblical portrayal of God. Promises of success and desires for more are frequent. consider Benny Hinn's promise " God is about to restore everything the devil has taken from you. "(Aug.27,1998 this is your day program, Lesea) this is not the first time this has been promised, but then its a Jubilee year, right. Several years back Hinn in Hawaii shouted, it is finished death and disease no longer have reign over us, disease does not, nor poverty. Many are unaware of how these men use Biblical words and concepts out of context to �make merchandise� of them. To claim the promise of Mark 10:30, Gloria Copeland explains the "hundredfold return" as, You give $1 for the Gospel's sake and $100 belongs to you; give $10 and receive $ 1,000; give $ 1,000 and receive $ 100,000. 1 know that you can multiply, but I want you to see it in black and white and see how tremendous the hundredfold return is.... Give one house and receive one hundred houses or one house worth one hundred times as much. Give one airplane and receive, one hundred times the value of the airplane. Give one car and the return would furnish you a lifetime of cars. In short, Mark 10:30 is a very good deal ( Laws of Prosperity 1974, pg.67)The Health and Wealth Gospel pg.89) This has an incredible impact for the spiritually naive and new believers. imagine giving to God (which usually means their ministry) and receiving 100 times more. If the banks ever found out about this they would probably invest in this spiritual law. But Shhh don't tell them. What of Mk.10:29-30 29: "So Jesus answered and said, "Assuredly, I say to you, there is no one who has left house or brothers or sisters or father or mother or wife or children or lands, for My sake and the gospel's, "who shall not receive a hundredfold now in this time-- houses and brothers and sisters and mothers and children and lands, with persecutions-- and in the age to come, eternal life. Jesus is using a extreme illustration, a hyperbole to give an example. First he says he who leaves houses brothers and sisters and lands. Have the promoters of this give to get formulae left these things, NO. They actually boast that they receive these things by giving by the tithe law. If this is literal then what of persecutions, there is to be 100 fold of persecutions attached to this deal... So what really is the intent of this passage. Mother or wife, brothers and sisters and children means we gain a whole new family, its related to fellowship. As we leave our family as a security to follow Jesus, he becomes our priority. We come into the family of God and gain a bigger family. Houses and lands are accommodations wherever we go for the gospel sake. God's promise of provisions for being in the family is eternal rewards. The persecutions came from those who forsook the comforts of their lives to follow Jesus. Their was in ancient times a price for their allegiance, they would lose their job and often times death. If we go back to the preceding verses the spirit of the text becomes clear. In vs.17-22 a rich man comes to Jesus asking how to have eternal life he points to the commandments of which he replies that he has kept them since he was young. Jesus sees he is sincere in his pursuit and loved him by saying the one thing hindering him: Go your way, sell whatever you have and give to the poor, and you will have treasure in heaven; and come, take up the cross, and follow Me. "22 But he was sad at this word, and went away sorrowful, for he had great possessions. vs.23 Jesus then makes the statement how hard it is for those who have riches to enter the kingdom of God the disciples are astonished he then makes it even clearer that it is hard for those who trust in riches to enter the kingdom of God vs.25 "It is easier for a camel to go through an eye of a needle than for a rich man to enter the kingdom of God." Those using this as the hundredfold return are setting a trap for themselves. This is not a guarantee give to multiply formulae. It means to give away your abundance to those in need so you wont be trapped by trusting in riches for your security in life and you will have treasure in heaven. Notice they did not give their money to Jesus or those who were with him but to those in dire need. Money often gets in the way of good judgment, especially when one is persuaded to give so they can get more; one blinds oneself by the promise of the future benefits from what they sacrificially gave. Jesus addressed this as well �Now he who received seed among the thorns is he who hears the word, and the cares of this world and the deceitfulness of riches choke the word, and he becomes unfruitful� (Matthew 13:22-23). Those who practice the seed faith giving may be many surprised when rewards are handed out by the Lord and they see others rewarded for giving much less than they did. Jesus is not concerned about amount but motives. Having your name read on the air of what commitment you made to give; he just may say to some you gave $50,000 on that telethon (as Benny Hinn did on TBN) and were recognized for that by everyone. You already received your reward. The Pharisees motives were be seen by all to make them look sacrificing as well as spiritual. These were wrong motives. This is modern day indulgences except its not Tetzel but Avanzini and Hinn, M. Murdock, Copeland, Fred Price, and Creflo Dollar. Give to get the anointing for healing, salvation for others, financial freedom, success in business loved ones saved. What they have done is give a whole new meaning to God's word through revelation knowledge. All the techniques the world uses we now see employed in Christianity. Every technique mentioned is now used by faith healers and teachers to scam millions of dollars from well meaning Christians for their ministries. All to give out the Gospel of how God can make you prosperous or give you a miracle by you sowing your thousand dollar seed into their ground. Hinn says "The wicked are piling up the funds and I love the way John [Avazini] teaches on this. He's the best there is on how to get the wealth of the wicked. Man, I like it!" (Praise-a-Thon, TBN, Nov.6, 1990.) Who is the wicked? Because all I see is him getting money from the Church! They are on the receiving end. We hear "the wealth of the wicked is stored up for the righteous." If you want the wealth of the wicked you have just joined their ranks. Hinn has said "Years ago they used to preach, 'O we are going to walk on streets of gold.' I would say, 'I don't need the gold up there. I've got to have it down here." (Praise-a-Thon, TBN, 2nd April 1991). On TBN recently Hinn spoke of Gold on his jacket and Paul Crouch said it was from heavens streets of Gold. So he is having it down here after all. This is promoting covetousness, this not faith in God's plans but exalting man to be in control and get what God has promised would be given at the end of our joiurney here on earth. Luke 16:14 Jesus points out �Now the Pharisees, who were lovers of money, also heard all these things, and they derided Him.� Then Jesus scolded them saying �what is highly esteemed among men is an abomination in the sight of God,� and He then summed it up by giving another parable -- the rich man and Lazarus. Such boasting is unheard of in the Scripture especially by ones own mouth. Paul writes in 1 Cor. 4:11-12 "To the present hour we both hunger and thirst, and we are poorly clothed, and beaten, and homeless. And we labor, working with our own hands." Were they lacking faith? Did they practice the seed faith we hear of from these famous TV ministries? 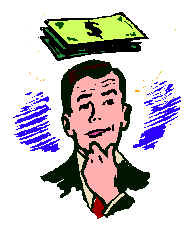 If your chances of going to heaven were greatly reduced by accumulating riches would you want to be rich? Would God make us his sons and then give us an abundance of riches that could possibly keep us out of heaven, that could take our affections away from him and compete for our devotion. None of this makes biblical sense. In Acts 20:33-34 Paul says we have not coveted anyones silver or Gold or apparel." Can the prosperity teachers say the same today. Certainly not! Where did this all come from? Well in modern times there was a man named Rev. Ike who mostly pitched this to a black audience. On Larry King he told Larry, "Money hates hypocrisy money does not like hypocrites. you say if you don't like your not going to get it? Its going to cause you to have some kind of problems even if you do get it. In his service he said "Jesus said seek you first, first what the kingdom of God and what , and his righteousness and what happens behind that? All these things, Cadillac's, fine homes, good clothes, then the congregation breaks out singing "I say all is mine. Acts.20:35 "It is more blessed to give than to receive". If they really believed the 100 fold blessing of sowing seed they would not be asking for you to give to them but they would give it all away and keep on giving to get more. But we don't see them do this, do we? In Acts 16 we find the Holy Spirit ruining greed not promoting it. When the girl who practiced divination claimed they are teaching the way of truth Paul exorcised the Spirit out of her. The entrepreneurs grabbed Paul and Silas when they saw their means of making a profit was gone. Paul didn't offer them God's way of earning more money did he! Jesus said to the religious leaders that prided themselves on keeping the law "But woe to you Pharisees! For you pay tithe of mint and rue and every kind of garden herb, and yet disregard justice and the love of God; but these are the things you should have done without neglecting the others" (Luke 11:42). When Jesus said "these are the things you should have done..." Did He actually mean we should tithe in the NT covenant? Jesus was saying to a group of people that they should do their tithing, without neglecting justice and the love of God. He was not speaking to the disciples, and He was not imposing tithing on them. We are not under the Law, we are under grace, we give now by our own convictions, not by legality. Certainly not to get a blessing because of required giving. Luke 14:13-14: "But when you give a feast, invite the poor, the maimed, the lame, the blind." And you will be blessed, because they cannot repay you; for you shall be repaid at the resurrection of the just." Both Jesus and Paul were concerned for the poor. Rom 15:26 "For it pleased those from Macedonia and Achaia to make a certain contribution for the poor among the saints who are in Jerusalem." But he did not use coercive tactics to solicit the funds for help. (Deuteronomy 14:22-29). The people kept a tithe to pay for their annual pilgrimage to Jerusalem . "Be sure to set aside a tenth of all that your fields produce each year. Eat the tithe of your grain, new wine and oil, and the firstborn of your herds and flocks in the presence of the Lord your God at the place he will choose as a dwelling for his Name, so that you may learn to revere the Lord your God always. But if that place is too distant and you have been blessed by the Lord your God and cannot carry your tithe (because the place where the Lord will choose to put his Name is so far away), then exchange your tithe for silver, and take the silver with you and go to the place the Lord your God will choose. Use the silver to buy whatever you like: cattle, sheep, wine or other fermented drink, or anything you wish. Then you and your household shall eat there in the presence of the Lord your God and rejoice (Deuteronomy 14:22-26). The people of Israel were required to assemble three times a year at Jerusalem (as the place chosen by the Lord) for the major feasts. This was meant to be a time of rejoicing and the Lord ensured that everybody had sufficient resources available to enable them to fully enter into the rejoicing by commanding that they set aside 10% of their annual income for that purpose.Vs.27"And do not neglect the Levites. This was a reference to the first tithe. In other words, the third tithe - for the annual feasts - was not to be confused with the separate and distinct general tithe for the Levites. Vs.28 "At the end of every third year you shall bring out the tithe of your produce of that year and store it up within your gates (The people paid a tithe for the poor, the orphans and the widows )And the Levite, because he has no portion or inheritance among you, and the stranger, the fatherless and the widow who are in your town, shall come and eat and be satisfied, in order that the Lord your God may bless you in all the work of your hand which you do." This was an all expense paid party by the Lord on all who did not annually share in Israel's blessings not excluding the Levites. Here is a witness and provision to those around who were not provided for. If one is going to go by the law why stop at 10% and why not be obedient to its all inclusive requirements even on themselves? Maybe it's because they only want to be on the receiving end and not the giving end, something to seriously think about.